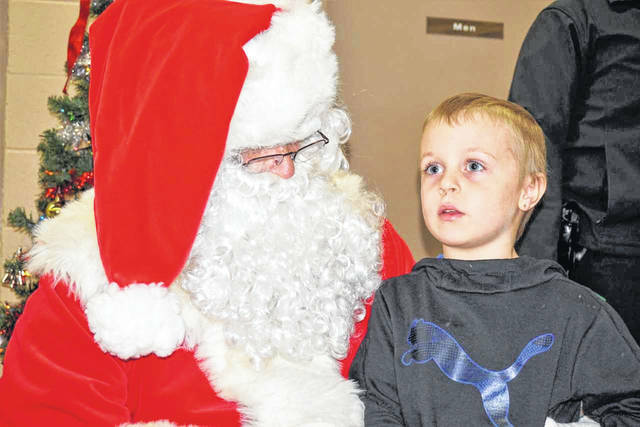 In wide-eyed wonder, six-year-old Landon Smith is pictured as he tells Santa his list of Christmas wishes at the New Haven Fire Station on Saturday. Santa also passed out treat bags to the dozens of children who sat on his lap. Activities did not go quite as planned in New Haven Saturday, when the New Haven Fire Department Auxiliary hosted its Christmas craft show, but the show was successful nonetheless. Normally the craft show coincides with the Christmas parade, but the daylong rain forced the parade to be postponed until Dec. 8. Pictured is a scene from the show. NEW HAVEN — It might not have gone as first planned, but most of the Christmas activities in New Haven continued successfully on Saturday. Normally, the order of things in the Bend Area on the first Saturday in December includes a Christmas parade in New Haven, along with the New Haven Fire Department Ladies Auxiliary Craft Show, then the holiday parade in Mason. But with the nearly all-day rain Saturday, both parades were postponed and rescheduled for Dec. 8. 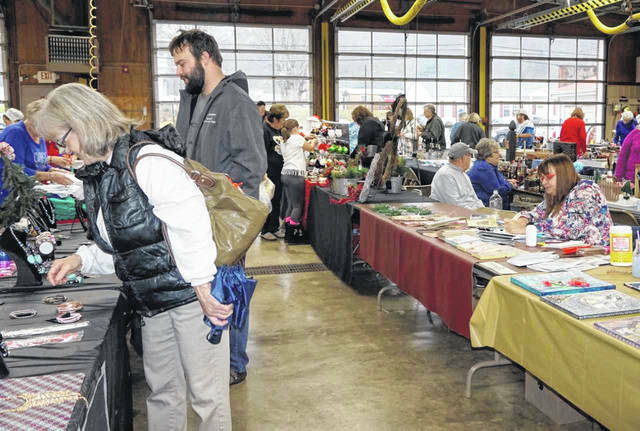 The craft show and visit with Santa went on, however, and according to organizers, were successful despite the weather. Duncan continued that many of the crafters shared that they had sold “a lot.” She added the auxiliary sold out of food in the kitchen, with one exception. Another thing the rain could not stop was a visit to the children by Santa Claus. From Barbie dream houses to items from the popular game “Fortnite,” Santa heard the wish lists of dozens of children, who also received treat bags. The New Haven Christmas parade will now be held Saturday at 11 a.m. Line-up will begin at 10:30 a.m. at the community center, off of Layne Street. It will continue to the old Napa building, where it will disburse to travel to Mason. In Mason, the parade entries will regroup at the Faith Baptist Church parking lot to begin the parade at noon. It will end at the town hall, where Santa will meet with the children and hand out treat bags and small gifts. Included in both parades will be entries by local churches that will depict 11 scenes from the Bible. They will go from the angel visiting Mary, all the way to the empty tomb following the resurrection of Jesus Christ. Churches participating are Fairview Bible Church, Northbend, Graham United Methodist, Salem, Mason United Methodist, St. Paul Lutheran, First Baptist, Faith Baptist, New Haven United Methodist, and New Haven Church of God. The church entries are being organized by Pastor Donnie Dye of Fairview Bible Church. Mindy Kearns is a freelance writer for Ohio Valley Publishing, email her at mindykearns1@hotmail.com.